It’s Thanksgiving Day here in the US! 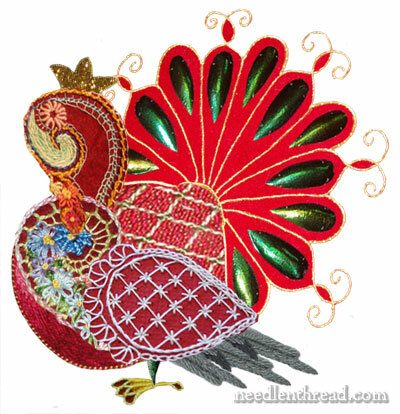 In honor of the day, I’ve resurrected the Textile Turkey. He’s rather hokey, rather silly, rather outdated – but I still like him! He made his first appearance on Needle ‘n Thread in 2008, when, early Thanksgiving morning, I realized I didn’t have anything Thanksgiving-related to display on the website. So, using a conglomeration of several needlework projects from the previous two years, I built my own turkey. So here he is – my Thanksgiving ambassador – wishing you and yours a very Happy Thanksgiving, wherever you are. Though it’s a US holiday, the sentiments that accompany the holiday defy boundaries. Thanks to each one of you, for making Needle ‘n Thread a worthwhile endeavor. You inspire me, you motivate me, you encourage me – and I am ever grateful for you! Happy Thanksgiving Mary! Hope you can relax with friends and family. We celebrate Thanksgiving a bit earlier in Canada, and it is nice to be able to say “Happy Thanksgiving” twice a year!! He’s great fun – and very impressive for such a speedy concoction! 🙂 Happy Thanksgiving! Happy Thanksgiving to you and to all! Oooooh how I miss turkey…. Happy thanksgiving Mary ! I hope you’ll have a wonderful day and thank you for your blog , I learn so much reading it. This is the first time that I saw your turkey. Does it have a modern flair of Jacobean in it? iLife it and if you put together a kit for it put me first on the list as a purchaser. Happy Thanksgiving but it is true that every day is Thanksgiving! Thanks for being you and sharing this wonderful art. He is too cute Mary! Thanks for sharing him. Have a very Blessed Thanksgiving! Love. It! Happy Thanksgiving to you as well, Mary! I am so grateful for people on the web like yourself who educate us all so selflessly and graciously. I’ve learned tons from you and appreciate all the inspiration! He’s a wonderful cheerful turkey. Happy Thanksgiving Day to you and yours as well! He is a lovely Turkey. Far too good to eat. Mary & Everyone, A very Happy Thanksgiving. Hope everyone has a little to stitch today. :) Mary, love the turkey! I don’t think your turkey is hokey. He’s beautiful, and Ilove him.Happy Thanksgiving to you Mary. Happy Thanksgiving, Mary! I’m so thankful for you and your blog. I like to wish you and your family a very happy thaksgiving day. Thank you for all that you do at NeedlenThread you inspire me and help me so much I don’t know what I would do without your daily blog to enlighten me every day. Love the turkey!!! I think Textile Turkey is beautiful and true beauty is never outdated! Thank you for hours of beauty, inspiration, fun, and food for thought–the best meal of all! I expected to see my beautiful card posted!!! Hope to talk to you today . …and may you have no family drama!! Mary, muchas gracias por tus deseos y que sepas que tienes entusiastas seguidoras en todo el mundo yo misma te sigo desde Madrid, España. Te deseo que pases un día muy feliz y te doy las gracias por tus estupendo blog. Happy Thanksgiving to you also, Mary. That turkey always brings a smile when I see it. Happy Thanksgiving to you and yours, and thank you for such a wonderful web site that teaches so much. Happy Thanksgiving to your, Mary, and admiration and best regards to your lovely turkey! Sending thanks your way for such an informative stitching site! Happy Thanksgiving! The turkey is scrumptious, yummy, gorgeous and all that. Love it. I don’t have my usual access to the computer for a couple of weeks so will have to catch up on some of your posts later. Next Next post: Blissful Beginnings – a Doubly Blissful Give-Away!